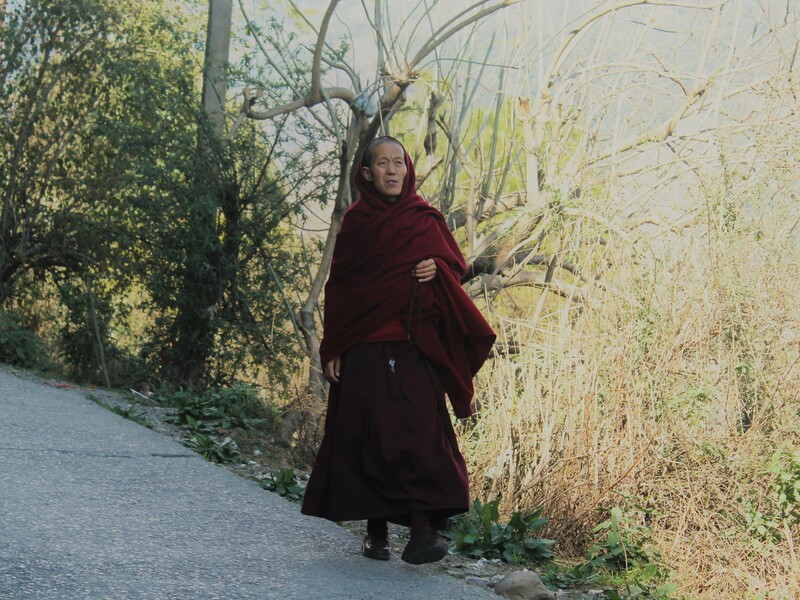 An essence of the cultural journey of Tibetans settled in Himachal Pradesh, a state in north India, is seen through their ritualistic and everyday lifestyle, choices of clothing and accessories. 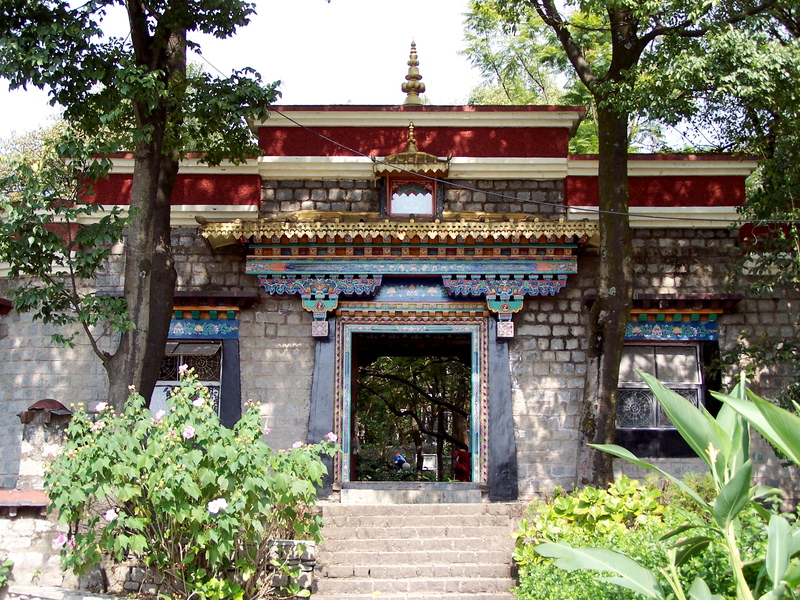 Entrance to Norbulingka Institute, Dharamshala, H.P. Your eyes wander over golden roofs shining in the sun and intricate paint strokes, as one passes by monasteries emanating peace and calm. 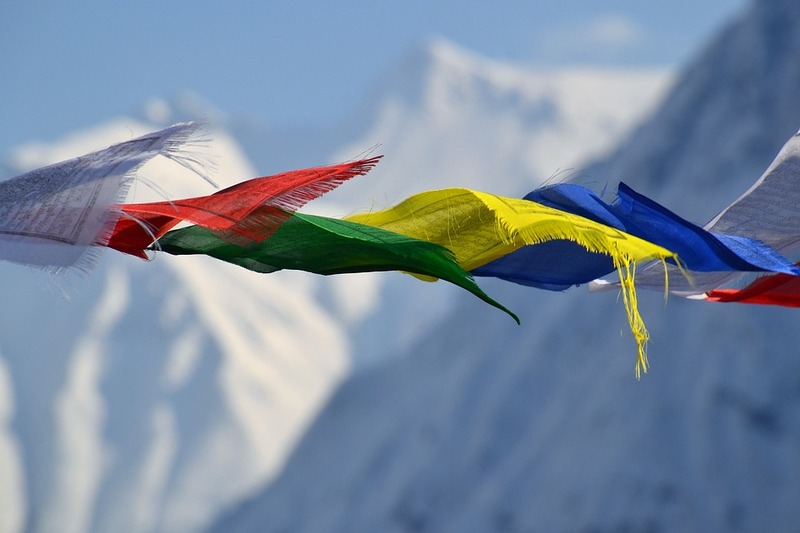 Perpetual strings with patches of brightly coloured fabrics are tied to lush pine and fir trees, with the chant ‘Om Mani Padme Hum’ written on them. When the 14th Dalai Lama fled to India from ‘roof of the world’ Tibet during the 1959 Tibetan uprising, a major population of Tibetans followed him and settled in India. A concentration of the same is located in and around the towns of Dharamshala and McLeod Ganj in Himachal Pradesh, amongst the Dhauladhar mountains. McLeod Ganj is a hill-station and tourist destination popular for its relaxing atmosphere, spiritual retreats, and adventure hotspots. 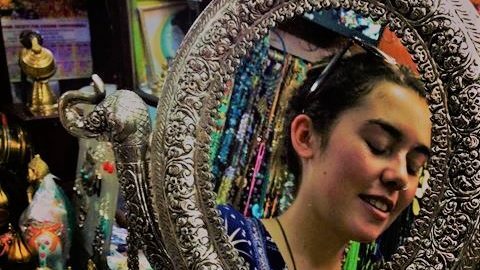 The main market square is filled with stalls selling Buddhist mantra (spell) prayer wheels, Tibetan singing bowls for meditation, prayer flags, yak wool clothing, wind chimes, rustic silver jewellery, and cafes offering every cuisine, including authentic Tibetan dishes. Buddhism, the religion which forms an indispensable part of Tibetan beliefs and culture, has played a crucial role in the construction of the lifestyle of Tibetan people, altering their behaviour, cuisine, beliefs, ornamentation and clothing. The Buddhist monks drape a Kasaya (a dark red cloth twice the body’s length) over their shoulders, wearing a turmeric-hued waistcoat and a red monk skirt underneath. 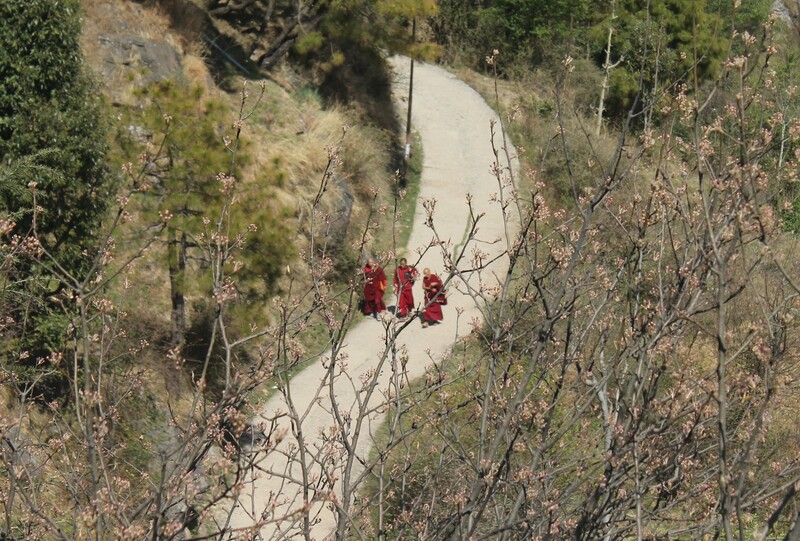 In winters you’ll see them wandering around McLeod Ganj in groups wearing a red woollen cloaks known as Dagang. When a monk is promoted to the highest academic degree of Tibetan Buddhism, his clothes are modestly trimmed with red satin. According to their monastic rank, monks carry around a small bottle for mouth-rinsing and instruments like the Suona horn (double-reed horn) and a monastic Bugle, a simple brass instrument. 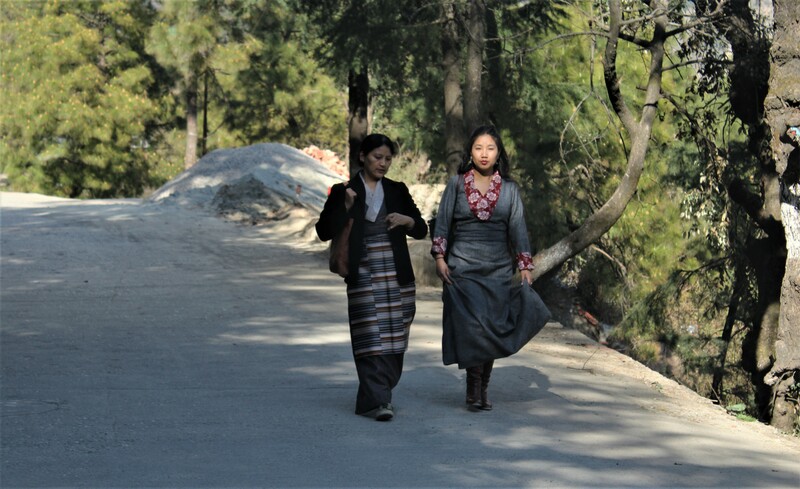 Tibetan women walk down hilly streets in Himachal Pradesh as they go about their daily routines, wearing vibrantly coloured aprons extenuating their waist, over simple Chuba, also called Zhuba, the traditional Tibetan attire. The robe is loose-fitting, with long sleeves and a wide waist buttoned on the right side, made in silk for special occasions, yak wool in winters and as a plain cotton garb during the summers. Men are seen wearing a high collared shirt under the Chuba which is often fastened with a cloth belt under the right arm. They accessorise with necklaces inlaid with cat’s eye gem, red coral and sometimes pearls or jade. Bracelets and rings are prepared using amber and silver, while belts are made of leather or precious metals, which are then gilded or studded with gems. 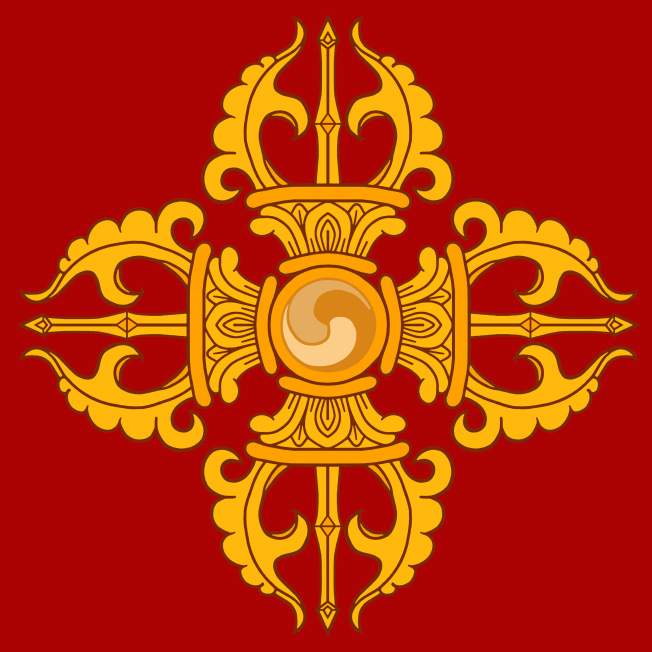 The Vajra motif and Buddha imagery are engraved or printed over many items of jewellery and clothing, and it is believed to serve as a ritualistic instrument for calming demons, dismissing sins and dispersing positivity. Their hair is decorated with strings garnering Lhayu Jade, a stone which is believed to represent the soul of the individual, accompanied with tassels made from precious metals and fabrics. In the winter snow, the head is protected against cold with fox or sheepskin hats and scarves.